It is a good idea to snack regularly throughout the day. A healthy snack will take the edge off your hunger so that you don’t binge at meal time. Eating snacks throughout the day can even help you feel less stress. Snack breaks are important, but so are the types of snacks you eat. Here are a few quick and easy snack recipes that taste good and are good for your body. With these snacks you won’t be tempted to eat processed snack foods high in sugar, and salt. This snack will easily satisfy cravings for potato chips and other salty snacks. Real Simple suggests sprinkling 2 Tbs. of grated parmesan over a whole wheat pita. Then add 1/4 tsp. of oregano over the top. Broil the pita until the cheese is brown. Then cut the pita into quarters. You can make several pitas at a time and store them in a ziplock bag for snacks throughout the week. Try dipping the pitas in humus for added flavor and nutrition. For a fast easy dip, Eating Well recommends adding a 1/4 tsp. of lemon pepper to a 1/2 cup of cottage cheese. You can dip crisp vegetables such as carrots, sugar snap peas or celery in this tasty dip. Try to use a low sodium cottage cheese. Cottage cheese is an excellent sources of calcium and adding veggies is a great way to get in extra servings during the day. If you have a sweet tooth, turn to fruit instead of a candy bar. Yogurt and fruit go together in endless combinations. Blend some yogurt and fruit together for a quick delicious smoothy, or keep your fruit whole to top the yogurt and make a parfait. This recipe from Fitness Magazine for a yogurt parfait is truly unique and delicious. The recipe makes six servings so share it with friends or portion it out in storage containers for sweet snacks during the day. Nuts are a healthy source of protein. A few handfuls of trail mix during the day can quickly boost your energy. 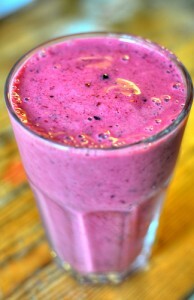 You can blend any combination of dried fruits and nuts to make a mix that includes all of your favorites. Try dried cherries, cashews and dark chocolate chips. Almonds, dried cranberries, raisins and walnuts also make a delicious combination. If you are watching your sodium, use unsalted roasted nuts and unsweetened dried fruit to avoid unneeded sugar. Take time to plan out your snacks for the week. This will go even further to help you avoid eating unhealthy snack foods. Prepare what you can ahead of time so your snacks are ready right when you are hungry. Eating healthy snacks will help you feel better and have more energy all day long. Do you have any favorite healthy snack recipes to share? Restless Leg Syndrome is a condition in which a person’s legs feel jittery or even in pain. Moving the legs can help relieve the symptoms. The symptoms most often occur while a person is resting or sleeping. Sitting or lying down seem to encourage the feelings associated with Restless Leg Syndrome. Restless Leg Syndrome can affect the sleep of those who suffer from it. They are often woken during the night. Some may not even notice awakening during the night, but will often feel exhausted during the day. Restless Leg Syndrome can be diagnosed by doctors through ruling out other sleep disorder possibilities. Once diagnosed there are several different treatment and prevention options. WebMD informs that medication may be prescribed for moderate to severe cases of Restless Leg Syndrome. However, not all people respond in the same way to the medication. For some people medication causes more severe symptoms while others may simply lose their effectiveness over time. Medication may provide some temporary relief for some people, but for others it is not a long term solution. As an alternative to medication, there are some lifestyle changes that may alleviate the symptoms over time. Mayo Clinic suggests cutting out caffeine, alcohol and tobacco. You can test whether these substances trigger symptoms by removing them from your diet for a time. If your condition improves, you know to avoid these item permanently. Mayo Clinic also recommends maintaining healthy sleep habits. Going to bed and getting up at the same time everyday and having a cool, dark, quiet place to sleep may help. Try to establish a regular bedtime routine and stick to it. WebMD instructs that those who suffer from Restless Leg Syndrome should get plenty of exercise, but avoid sudden bursts of energy or activity. Stick to a similar exercise routine everyday. Stretching exercises such as yoga may be particularly helpful. Message and warm or cold packs may also help to relieve symptoms. Warm baths before bed can also help relax restless legs. When your Restless Leg Syndrome is leaving you exhausted during the day, see a doctor. Chronic sleep loss can have severe consequences and a doctor can help you get some rest. If you suffer from Restless Leg Syndrome, you will have to try the individual remedies and determine what works for your symptoms. Ultimately, taking care of your body, by eating well, sleeping enough and exercising should relieve some of the symptoms. Adjustable beds have a wide range of functionality, but the typical adjustable bed will allow you to raise or lower your head and feet according to your most comfortable sleeping position. There are several reasons an adjustable bed is ideal for a restful night of sleep. One of the primary reasons for investing in an adjustable bed is joint, neck or back pain. Adjustable beds relieve this pain while sleeping because it allows you to manipulate the bed removing pressure from trouble areas. Changing the position of the bed, rather than lying flat will help you sleep with a more natural curve in the spine. It can also relieve pressure on hips, shoulders and the neck. 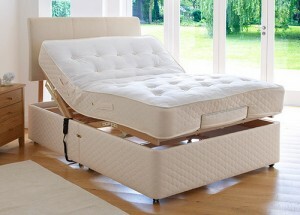 One hidden benefit of adjustable beds is improved circulation. Sleeping flat prevents the even distribution of pressure over the entire body. According to SpinLife: “This increases strain on the heart by forcing your heart to work harder to take nourishing oxygen to your body through the bloodstream.” This usually results in minor muscle aches and pains or perhaps swollen feet or ankles. However, sleeping on an adjustable bed may also help those suffering from more serious heart problems as well. If you have serious problems with acid reflux, sleeping in an inclined position may provide some relief. Sleeping upright can use gravity to help prevent stomach acid from moving back up your esophagus, which causes the burning sensation associated with acid reflux. One disadvantage to adjustable beds is finding linens that fit. 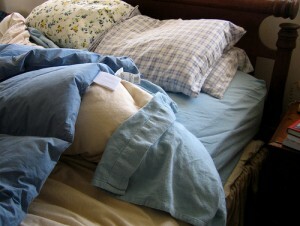 Sheets often slip and slide while moving the bed into various positions. Cozytown Linens offers customized sheets for any size of adjustable bed. These sheets will always stay in place as you move the bed to your preferred positions. If you have muscle or back pain that keeps you from sleeping at night, you may want to consider an adjustable bed. Only invest in an adjustable bed if you know you are comfortable sleeping in an inclined position. For example, if you would rather sleep in a recliner than in your bed, an adjustable bed would be ideal. While adjustable beds are great for relieving pain, some people simply cannot sleep in an inclined position. Your comfort is the most important. Take time to choose a bed that will offer you the most comfortable night of sleep possible. April 10, 2013 | Posted by Lee C.
As spring gets underway it is fun to brighten your home with classic signs of the season. Here are a few fun crafts and decorating ideas to bring the sunny spirit of springtime indoors. Dogwood blossoms are one of the most beautiful signs of the season. Martha Stewart suggests making long lasting artificial dogwood flowers out of paper. She gives step by step instructions here. Once the flowers are fixed to a branch you can place them in large vases. Foyers are great places to display these large arrangements. You can also use cuttings of live branches in bloom from any flowering tree. The arrangement won’t last very long, but the real flowers are very lovely and often fragrant. If you are looking for a major household transformation this spring, try a new color scheme in your bedroom. HGTV recommends a few of the trendiest spring color combinations including: tomato red and turquoise, deep red and hot pink, and yellow and grey. Try mixing prints and solids for a bold new look. HouseBeautiful suggest creating dramatic flower arrangements using flowers with the same shades of color. For an even more dramatic look place the arrangement in a matching vase. 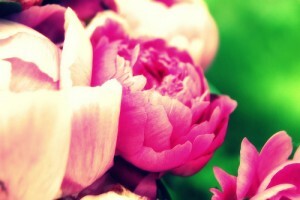 Peonies are a quintessential flower of spring and are sure to brighten any indoor space. Pressed flowers are an easy and long lasting way to bring the outdoors inside. Pansies and other small spring flowers work especially well for pressing. Home Made Simple provides instructions for pressing flowers and for making pressed flower coasters. You can frame pressed flowers and display them as art. Old window panes are perfect for this. You can also make your own candles using pressed flowers or herbs. Wreaths are a great way to decorate for any season. If you are in need of a colorful spring wreath, here is an easy idea from Debbiedoo. She used two bright colors of burlap, found at craft store. She cut the burlap into squares and then poked the center of the squares into a grape vine wreath. You don’t even have to get out the glue gun unless you want to add embellishments. These are a few fun and easy ways to brighten up your home for spring. Take time to enjoy sunny colors and find inspiration in the life that is unfolding outdoors. Do you have any favorite spring crafts or decorations?